Technically speaking, Volkswagen’s new Jetta GLI is an impressive take on the ever-shrinking sport sedan market. Even in its base $25,995 S trim, the GLI receives the GTI’s 2.0 turbo-four, which is good for 228 horsepower and 258 lb-ft of torque. While not quite hot rod numbers, the punchy powerplant should have no problems moving the 3,217-pound Jetta to and from the grocery store with a little more pizzazz. All GLIs also come with the same brakes used on the Golf R, which are 13.4-inch vented discs in the front and 11.8-inch discs in the rear. Motor Trend’s Alisa Priddle was thoroughly impressed with the GLI’s road manners, stating that “clinically the GLI scores all As.” In her road test, she explains that the GLI’s highlights include the car’s direct steering, effective brakes, and overall “verge-of-boring” stability in the corners. With its main competitor being the Honda Civic Si sedan, there’s no doubt Volkswagen is taking a more formal approach to the affordable sports sedan market. But which boxes should you check on your GLI order sheet? When it comes to affordability, you want to make sure you’re getting the most bang for your buck. If you can live without leather, a 10-inch center screen, and Volkswagen’s digital cockpit, you’re better off skipping the top Autobahn trim, which starts at $29,185. The mid-level trim, called the 35th Anniversary Edition, is only $1,000 more than the base S model, and comes with all the performance goodies I would expect from a sport sedan. Bumping up to the 35th Anniversary Edition brings the highly praised DCC adaptive chassis control system, as well as adding attractive 18-inch dark gray alloys with red accents and 35th Anniversary badging. Standard equipment includes blind spot monitoring, forward collision warning with emergency braking, a 6.5-inch center touchscreen, and heated front seats. Going with the 6-speed manual transmission saves $800 over the 7-speed automatic. The 6-speed is the same transmission used in the normal Jetta, but shares its gear ratios with the GTI. While the automatic is considered intelligent with its shift points, my millennial mind is still not quite ready to surrender the third pedal. Exterior color choices are limited to four on the 35th Anniversary trim (red, gray, white, and black). Picking a color is completely subjective, but going with the inappropriately named “Pure White” gives the German a proper sleek yet formal appearance. The red and black trim accents keep those in the know well aware that you haven’t given up on the idea of sportiness. Since I live in the Pacific Northwest, wet and muddy conditions occur almost daily, so the only freestanding options I selected were the GLI rubber floor and trunk mats. In total, my spec sheet came to $28,100 including the destination charge. When compared to the economically priced 2019 Civic Si, the GLI is actually a better buy in terms of value. The Si sedan starts at $24,300, but that price balloons to $28,299 when the performance package is selected (it includes a sportier HFP suspension, 19-inch wheels, and various trim pieces). 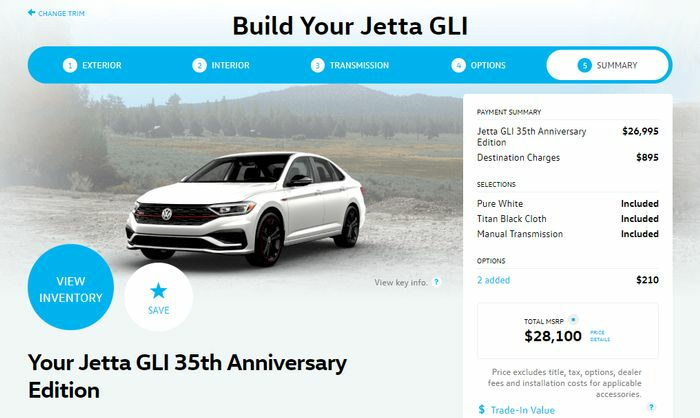 The GLI also includes a 6-year/72,000-mile transferable bumper-to-bumper warranty, while the Civic Si comes with 3-year/36,000-mile basic and 5-year/60,000-mile powertrain coverage. 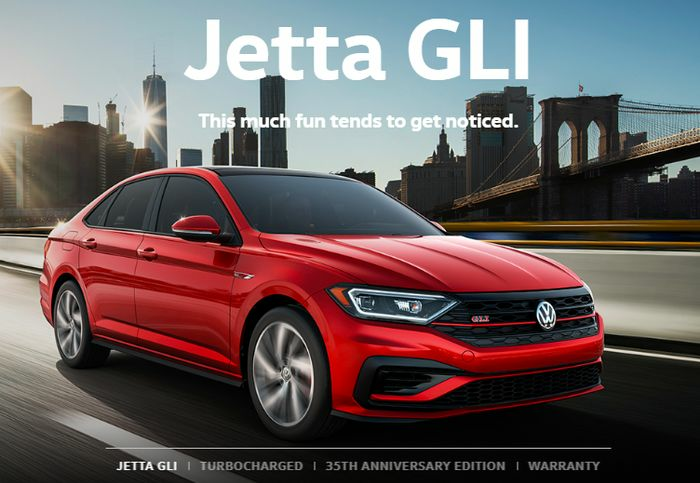 With a more mature appearance, a superior warranty, and the heart if a GTI, Volkswagen’s new GLI is certainly worth a look for buyers in search of an affordable sedan with some real muscle.